Ubisoft® shows brand new game feature during The Game Awards. 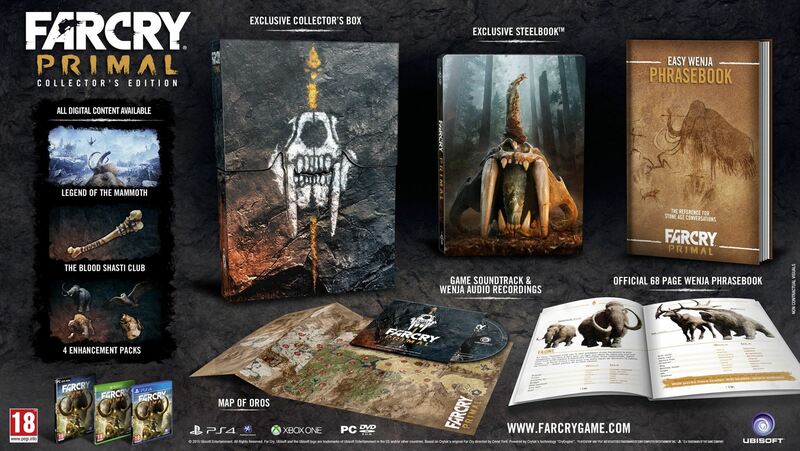 Ubisoft has revealed the content of the different Collector’s Editions for its upcoming title, Far Cry® Primal. The latest installment of the critically acclaimed Far Cry® franchise will hit the stores on February 23rd, 2016 on the PlayStation®4 computer entertainment system and Xbox One, the games and entertainment system from Microsoft. The game will release on March 1st 2016 on Windows PC. The Stone Age is a dangerous place, but the Far Cry Primal Collector’s edition will equip every player and Far Cry fan with the best premium package to survive Oros, allowing them to understand the terrain and master the prehistoric in-game language. Official Wenja phrasebook: your guide in Oros, full of useful words and in-game sentences. It is a condensed collection of the work of specialists/experts that have adapted a unique language for this game, based on the Proto-Indo European language. The official game soundtrack and Wenja audio recordings to discover the basics of Far Cry Primal’s official language. Digital Content: all digital content available, a complete pack of ”Legend of the Mammoth” missions, a new weapon and 4 enhancements packs. “Legend of the Mammoth” missions:Up to 45 minutes of additional gameplay, where the player will have the unique opportunity to play as the largest animal in Oros, the almighty mammoth, and feel the power to stomp its enemies and defend its herd from other beasts and humans. o Duel of beasts: A powerful rhino spirit dares to challenge your might. Battle him and his herd across treacherous cliffs to assert your dominance. o The trapped elder: Bloodthirsty hunters have trapped your leader. Crash their camp and lead the elder to freedom. o Hunt the hunter: The time for revenge is now. Lead your herd to crush those who threaten your survival. A new weapon, the Blood Shasti Club:A bloodstained club of bone and teeth once wielded by Ull, the vicious leader of the Udam. This weapon is unbreakable and cannot be consumed by flame. 4 enhancement packs: Offers early access to rare resources and unique customisation options. Recently held, at The Game Awards that took place in Los Angeles, Ubisoft premiered its “Beast Master” Trailer, a brand new feature that will enable players to tame the predators they find in the open-world and use them as weapons. From wolves to sabretooth tigers to cave bears, and, yes, even the honey badger, players will be able to summon these animals at any moment and use them as they prefer, from taking down their enemy, scouting the area, or acting as a distraction during battle and hunts. With those animals at their side, the player will have many opportunities to fight and defeat his enemies to take back control over all Oros. Far Cry Primal brings players back to the Stone Age, a time of extreme danger and limitless adventure, when giant mammoths and sabretooth tigers ruled the Earth, a time when humans were not at the top of the food chain but were fighting to climb it. As the last survivor of his hunting group, the player will learn to craft a deadly arsenal, fend off fierce predators, and outsmart enemy tribes to conquer the land of Oros and become the Apex Predator.